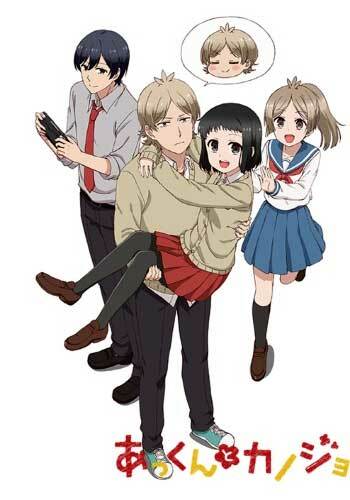 Atsuhiro Kagari –Akkun- is just a high school student, and he is dating Non Katagiri –Nontan-, an old friend. For some reason, he is grumpy towards her, however, deep inside he dies for her. Only Masago Matsuo knows how Akkun really feels, and Nontan understands that every time he says something cold or distant, he is just acting though. For her, Akkun is just shy, however, Masago knows that is not the case, and it is not rare for Akkun to follow her in secrecy, near to become a stalker. One day, Nontan asks Akkun to walk home together. He refuses and tells her to get lost; she does not complain and simply leaves without him. A minute later, he is walking behind her, taking pictures. Masago tells him to get closer and take a picture, and Akkun thinks he will die, after all, for him, Nontan is an angel. Masago argue that he can be near her without being weird; after all, they are a couple. The next day, Nontan approaches Akkun with a big smile, she has drawn a mascot and wants to show it to him. It is a strange drawing, and Akkun simply tells her that it is bad, next, he runs out of the room to make a scene. On the other hand, is Nontan, a clumsy and cute girl, happy enough to see Akkun’s smile occasionally. Somehow, they will be all right. A manga series written and illustrated by Waka Kakitsubata. It began serialization in Media Factory’s Monthly Comic Gene magazine in June 2013. An anime series adaptation by Yumeta Company began on April 6, 2018.